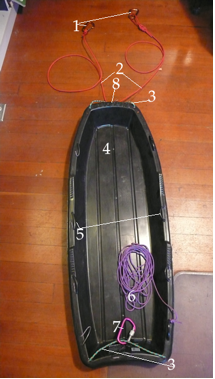 Read an updated version of this article on how to rig an expedition sled on our main website, AlpineInstitute.com. There are definitely some methods that are better than others, but in the end, sleds are inconvenient, cumbersome, get in the way, and frustrate you to no end. During the moments where your sled is working smoothly and efficiently, revel in it, because soon the path ahead will change and it will be pulling you off balance, tripping you, getting tangled in the rope, and flipping over. Don’t worry - it is all par for the course and part of the joys of expedition climbing. Having set the stage for frustration, I can now say that sleds are invaluable tools on expeditions like Denali’s West Buttress. The hassle is more than worth the benefit of not having to carry all that gear on your back. 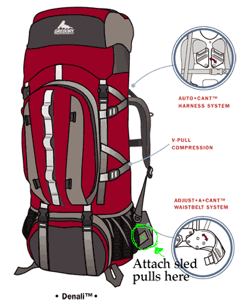 Below you will find a description of a system that AAI uses to rig and pull expedition sleds. What method will work best for you will ultimately depend on your sled and pack models and what feels best given your dimensions and load. • The majority of the sled weight should be born by your hips and not your backpack or shoulders. • Some form of a sliding or self-equalizing attachment point for the sled tether/sled attachment is very useful in maintaining equal load on each tether while traversing or on uneven terrain. • Make sure your attachment system is redundant and that total failure of loss of a sled is not possible. • Be patient. When you get tripped and fall down for the 10th time that day, chuckle and remember that you aren’t working and you are in the mountains, so how bad can it be? • Mind the sled in front of you. Don’t forget, when going downhill on a rope team, you are responsible for managing the rope and sled in front of you. This means constantly paying attention and putting forth continual effort to keep the rope and sled from running into the pack of your buddy. • Experiment with different set-ups if yours does not feel manageable or sustainable. If your sled seems like an unmanageable burden or if it puts unbearable weigh on your pack, mix it up a bit and use the principles contained herein to guide your experiments. 3. 2 x 3-foot pieces of 6 mil cord. 5. Attachment points for duffel tether. 7. 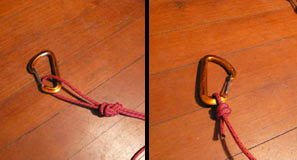 1 x locking carabiner for rope attachment. 8. 1 x locking carabiner or a pulley. 1. 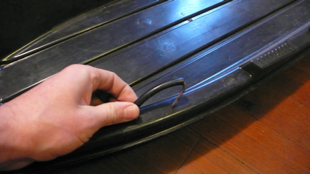 Make sure your sled has attachment points or loops for your duffel bag tether feed through. These are labeled #5 in the photo. If your sled doesn’t have them, they are easy enough to fashion with any thin cordage. yours doesn’t have them, they are easy to make from thin cord. 2. Form the nose and tail attachment points with the two pieces of 3-foot 6 mil cord. 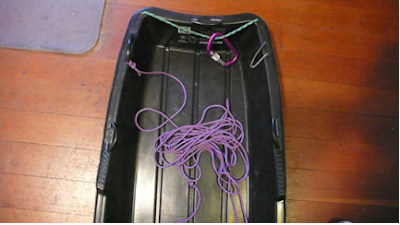 Do this by making a loop from the cord using a double fisherman’s knot threaded through holes in the sled. The length of the cord will depend on your sled and the hole configuration. Three feet seems about right for most models. This attachment point needs to be a loop using a secure knot. This will prevent loss of the sled if one hole in the plastic were to fail. using the 3-foot sections of 6 mil cord and a double fishermans knot. 3. Set up your sled pulls using the 11 to 13-foot length of 6 mil cord and the two non-locking carabiners. There are a few ways to attach the sled pull to the nose attachment point. My favorite, even though it is more gear intensive, is to use a small crevasse rescue pulley. This allows the sled pulls to run freely through the attachment point and to remain equalized on uneven terrain. To do this, I run the nose attachment cord through the carabiner hole in the pulley and they run the sled pulls through the pulley wheel hole. 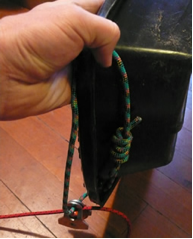 A carabiner can also be used in place of the pulley, but this would allow the sled pull to slide all of the way through the carabiner should one of the pack attachment points come undone. As long as you build redundancy into your sled attachment, this shouldn’t be much of a concern. cord is the sled pull cordage which will attached to your pack. 4. Fashion your attachment method for the sled pulls. Again this can be done a number of ways. I recommend either a figure-8 or fisherman’s knot on a non-locking carabiner as pictured below. These will attach to your backpack. 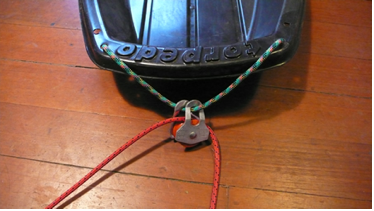 To attach the sled pulls to your pack, use two non-locking carabiners and either a fisherman’s knot or a figure eight. Use these knots to adjust the length of your sled pulls to your ideal distance from the sled. 5. Attach your duffel bag tether. This is the 25-foot piece of 4 mil cord that will be used to tied your duffel bag and gear to your sled. I usually tie one end of this directly to your nose or tail attachment point of the sled rather than one of the smaller and weaker attachment points as in the picture. The tail rigging (same loop as for the nose) and duffel bag tether. 6. Attach your sled pulls to your pack. Unfortunately, there are many variables in this aspect of the rigging process. What system will work best depends on the configuration of your pack and a few other factors that can’t really be assessed ahead of time. Remember the principle concern is to get the weight of the sled onto your hips and not the pack itself. Below is a diagram that shows an attachment point that works well on the Gregory Pro pack. Most other similarly sized packs have an attachment point on or near the wait belt that can work well. If your pack doesn’t have a suitable attachment point on the waist belt, one can be fashioned by wrapping 6 mil cord around you pack and forming a power point to attach the sled pulls to. In my experience, this is a less user-friendly and efficient method and should be a last resort. Setting the length of your sled pulls for optimum distance from your sled can be tricky, and it is something that you will get a feel for over time. As a general rule, I think it works best to have the sled pulls as short as possible while having them far enough away from your feet that they won’t easily interfere with walking. Bear in mind that on the descent, the person behind you will be managing your sled, which will tend to chase you down the hill, and so you don't want the sled pulls too tight or it will be more difficult for your sled manager to keep the sled from hitting your feet. 7. Attach the sled to the climbing rope. In most cases while in glacier travel mode, you will want your sled tied into the climbing rope. This is most often and most easily accomplished by using a clove hitch on the locking carabiner (see tail rigging photo above). Tying the climbing rope into the sled servers a few different purposes. First it allows the person behind you on the rope team to manage your sled while going downhill. Second, it provides some redundancy to your primary sled attachment to prevent loss of a sled in the even of a crevasse fall or knot/equipment failure in the primary system. 8. The last and final step…PULL!! To view a pdf version of this article, download here. To get in touch with our guides, please email us at ak-programs@alpineinstitute.com. AAI runs several expedition training programs, such as our 7-Day Alaska Mountaineering - Denali Prep. We also run seven guided Denali climbs each season. Red Rock Rendezvous - March 19-21!